The growth prospects of biosensors industry seem to be rather pronounced in recent times, given the exponentially rising commercial utilization of these sensors in the food, healthcare, biotechnology, and other sectors. The imperative deployment of biosensors has gained paramount importance in the field of drug discovery and biomedicine, which are currently the hotspots in the medical space. The rising quest for operational efficiency, especially in healthcare has led to the invention of precise and powerful analytical tools, utilizing a biological sensing element, known as biosensor. Quite overtly, the term biosensor has been applied to a number of devices that are used to detect various biological elements such as cells, tissues, antibodies, enzymes, organisms, and nucleic acid. Biosensors have undeniably acted as catalysts for innovations in the healthcare industry and are further gaining significant popularity in diabetes management via blood glucose monitors. Reports claim that the tremendous rise in the number of diabetic patients will have far-reaching implications on the growth prospects of biosensors industry. As per statistics, the global prevalence of diabetes is anticipated to cross 552 million by 2030 from 366 million in 2011. 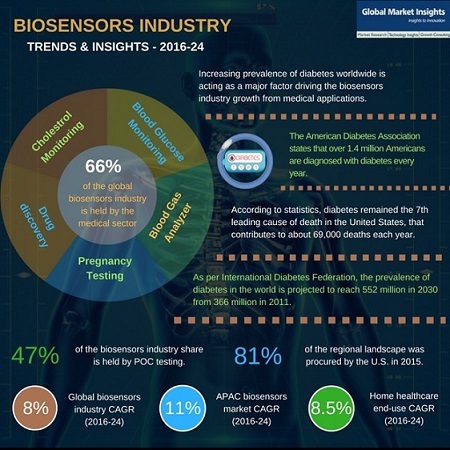 In context, the alarming prevalence of diabetes has triggered the need for efficient diagnostics devices, which in turn has catapulted biosensors market growth. Considering that these products are effective and powerful tools for monitoring and diagnosis, it comes as no surprise that the global biosensors industry is rapidly paving its way in the medical field. The technological advancements in this domain have enabled tests to be conducted faster on smaller devices. With the growing popularity of affordable, user-friendly, and portable devices, these tests are moving out of laboratories and getting closer to patients at point-of-care facilities. As per estimates provided by Global Market Insights, Inc., this trend is likely to continue over the coming years with point-of-care testing segment contributing to a major chunk of the overall biosensors industry share. Having accounted for more than 47% of the overall biosensors industry share in 2015, the PoC testing is anticipated to be one of the chief segment leading the end-use landscape. Continued technological advancements in sensors have been forecast to form the foundation for better diagnoses and sound health. Experts believe that the early intervention of diseases with the help of biosensor technology will provide the opportunity to not just cure illnesses, but also prevent them from occurring in the first place. Biosensors industry players have been resorting to the strategy of pragmatically optimizing technological developments to meet the commercial objectives, such as compact size and fast response time. Citing a valid instance, Apple Inc., is reportedly disrupting biosensors market by developing an electronic ring full of biosensors. The patent filing reveals that the gizmo is expected to comprise technology that includes several biosensors for monitoring perspiration and cardiac rhythm. The tech-giant is making use of several biosensors to collect biometric data of users that can be displayed on the electronic device, touted as the iRing. The fact that the United States held a mammoth proportion (> 80%) of biosensors market share in 2015, provides sufficient evidence to claim that U.S. was the highest revenue generator in this business vertical that year. This appreciable contribution can be essentially credited to the growing prevalence of diseases such as cardiac disorders and diabetes in the region. According to statistics, diabetes remained the 7th leading cause of death in the United States, that contributes to about 69,000 deaths each year. In addition, the American Diabetes Association states that over 1.4 million Americans are diagnosed with diabetes every year. Amidst the backdrop of this scenario, it is undeniable that the rising prevalence of obesity and diabetes would continue to remain one of the most pivotal factors driving the regional demand for biosensors. Observing the lucrative opportunities and expansion scope of biosensors industry in diabetes management, several companies have lately been introducing a series of valuable tools such as the blood glucose biosensors for continuous monitoring. In essence, it would not be incorrect to state that companies partaking in biosensors industry share have effectively recognized the crucial role that diabetes management plays in augmenting the revenue graph of this business vertical. Speaking of diabetes monitoring, it is important to know that people diagnosed with Type 1 and Type 2 diabetes are expected to test their blood glucose levels around 4 to 10 times a day. This can be a time-consuming and painful process which according to research reports is neglected or skipped by around 80% of the patient populace. In this regard, biosensors industry players are apparently making things easier for the diabetic population, by the means of biosensor technology. For instance, the K’Track Glucose tracker by PKvitality is a wearable device that has put an end to blood tests altogether. Instead, the tracker analyzes the chemical configuration of interstitial fluid and eliminates the need to carry several tests that get in the way of day-to-day activities. The rising adoption and success of glucose blood meters has also considerably stimulated the regional biosensors industry, slated to witness a noticeable growth rate in the coming years. Needless to say, technological interventions have left an inexorable impact on the revenue scale of biosensors market. In fact, reports claim the overall valuation of biosensors industry to be worth around USD 14.8 billion in 2015. With the notion of biosensors and implantable devices diagnosing human heartbeats, perspiration and blood cells gaining momentum, modern-day monitoring techniques have been emerging as major disruptors in traditional care. Leading players partaking in biosensors industry share are seen tapping into graphene based electrochemical biosensor development for healthcare. The invention of the electronic skin or the so-called “e-tattoo” is claimed as one of the most fascinating future trend unfolding in biosensors industry space. Experts predict that the rising trend of developing critical monitoring devices with the use of biosensors will have a remarkable impact on the commercialization matrix of biosensors market. Moreover, analyzing the rapid penetration of biosensors in myriad applications including agriculture, defense & military, and food sectors, the global biosensors industry is certain to traverse a lucrative roadmap over the ensuing years. In fact, biosensors market size, as per analyst forecasts, is likely to exceed a valuation of USD 29.6 billion by 2024, at a CAGR of 8% over 2016-2024.